If you liked this show, you should follow Jeff Wilson. 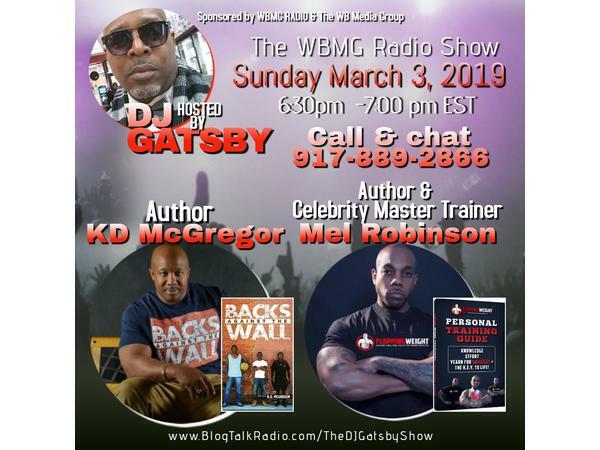 Join me this week on The WBMG Radio Show with DJ Gatsby when my guest will be Author KD McGregor and Author / Fitness Trainer Mel Robinson. They are appearing at the LITerary MIXer being held on March 29, 2019 at The Dwyer Cultural Center in Harlem,NY. They're gonna talk about their respective careers as well as this highly anticipated LITerary MIXer Event. Norman Robinson, better known as K-Mel, came up from poverty raised in the center of Harlem. Battling through trials and tribulations where he did a four year bid of a 5-10 year drug conspiracy conviction. Now, here he is an Author and Fitness Guru with his own brand and Workout DVD to match his confidence. He is a master trainer and self-proclaimed to be the best in New York City- arguing as one of the top 3 trainer on the east coast. Hailing from the village of Harlem NYC, author K.D. McGregor is determined to shake up the literary world with his thrilling urban fiction collection being released on his own FEVER KDM Publishing enterprise. His debut release of the tile Backs Against the Wall is a gritty page-turner, touching on some of the challenges families face in various urban communities across the country. With his first printed literary work, K.D. McGregor asks of the public, what would you do if your back was against the wall?